يقع فندق أوكلاند سيتي في مركز مدينة أوكلاند, أوكلاند, هو خيار شائع بين المسافرين. يمكن من هنا للضيوف الاستمتاع بسهولة الوصول إلى كل ما تقدمه هذه المدينة النابضة بالحياة. إن سهولة الوصول من الفندق إلى المعالم السياحية الشهيرة الكثيرة في المدينة كمثل تاون هال, ‪St Matthew-in-the-City Church‬, سكاي سيتي كازينو هو استثنائي بحد ذاته. إن الخدمات التي يقدمها فندق أوكلاند سيتي تضمن للنزلاء إقامة مريحة. هذه بعض الخدمات الموجودة في هذا الفندق: واي فاي مجاني في جميع الغرف, خدمة التنظيف يوميًا, مجهز لذوي الإحتياجات الخاصة, مكتب الاستقبال على مدار الساعة, مرافق مخصصة لذوي الاحتياجات الخاصة. تعكس غرف الفندق البالغ عددها 135 المنتشرة في 10 طوابق جواً من الدفء والألفة.خدمات عصرية مثل مناشف, سجاد, غرفة معيشة منفصلة, تلفزيون بشاشة مسطحة, صوفا موجودة في بعض الغرف المختارة. إن مركز للياقة البدنية هو المكان الأمثل في الفندق للاسترخاء وتفريغ طاقتك بعد نهار طويل. إن فندق أوكلاند سيتي هو خيارك لخدمة الفنادق الراقية في أوكلاند. Stayed in Auckland over New Year’s weekend. Great that the hotel’s location is right smack into the center of everything and convenient walking distance from Sky City where we waited for New Year’s Countdown. Our studio was always kept tidy when we arrived back - tho we didn’t use the kitchen and dining facilities at all! Would love to stay here again! Thank you for having us!! Very convenient location, very friendly staff. Hotel Ambassadors on duty are excellent in providing the service with a smile and makes you feel very welcome at this hotel. And a very good effort by the hotel to have various nationalities on duty as Ambassadors reflecting the International standard for this hotel. Staff were nice and accommodating. The location is good also, close to the Sky Tower and walking distance to Aotea Square. The hotel itself is clean and the apartment is big and we had a comfortable stay. i was using auckland city hotel for 2 nights, it was amazing. with great location, very near to auckland tower which is city center of auckland. the staff was great! friendly and really helpfull with our holiday plan. The hotel was overall great, the staff were friendly and responsive and the location was great! A lot of places we went to were mostly just a walking distance away. If I ever returned to Auckland, I would probably stay here again! Excellent location. Very close to everything. The staff are very helpful and friendly. I asked one of the staff the checkout time and she helped me to extend one hour without asking the reason. Indeed I was sick and it really helped me a lot. I would return if I visit Auckland again. 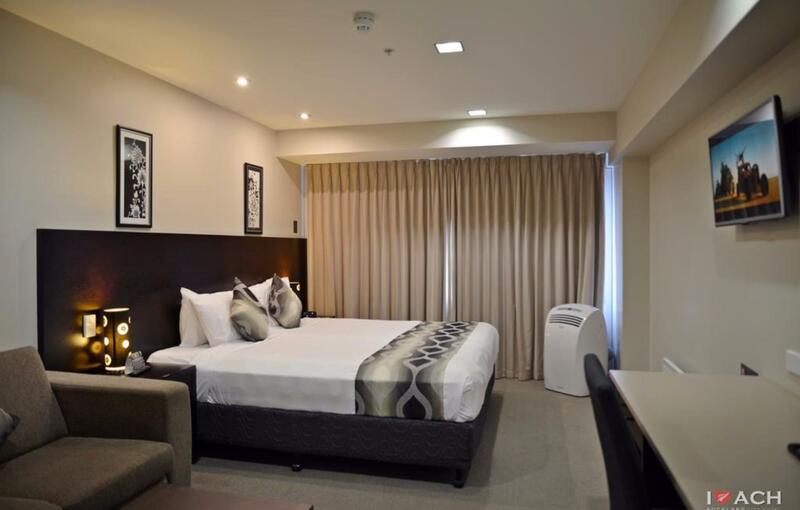 The hotel located in the heart of Auckland, very convenient and the room is nice and clean. Great location, fairly clean rooms. Chaulk could use refreshing, but overall a good place to stay. We had a quiet room in the back. Staff was friendly and we felt it was a fairly good value. Thanks ACH. Room was modern and clean. There was a place to cook though we didnt use it in our room. Wifi is limited though only 500mb per day. Also bathroom was small but we didn't mind, and no lock in the bathroom. I love this hotel. Good access to any place within Auckland, all walking distances. Good food offered in the restaurants; nice clean rooms. Comfortable to stay in. I'd be back for sure. This is our 2nd time to stay here. The location of this hotel is good. You can find lots of restaurants nearby. It takes only 10-minute walk to Queen St which is the most popular area. The only downside is the overnight parking fee is NZD30 which surprises me. But it seems hard to find an accommodation with free parking in Auckland city center. Walking distance to city center, comfortable bed, have kitchen in room. However you will need to pay $30 or so for parking at the hotel and is quite limited. Else you will have to look for parking around the area. We had to park our car quite far away that nite. It takes 10 minutes walk to the sky tower... like 15 minutes walk to queen st. If you're taking skybus like me, you have to take off at queen st. And take you luggage and walk uphill like for 3 streets to the Hobson st. It's a bit tough.. No privacy, you have to close the curtain all the time. There is only a fan but not a installed air on in the room like usual though it is cool enough. Close to everything. The only difficulty was to climb up/down the stairs leading to the hotel lobby with our heavy luggage. The hotel door with the ramp was closed during our check-in and check-outs. The hotel experience is all excellent. Except that, we took Skybus to the hotel with a representation made by Skybus that it is walking distant from the last stop. It is if we were backpackers without many bags. For parents with 2 toddlers + 3 luggage and 2 backpacks + it is quite hilly from the last stop to the hotel + cold weather at night, we took almost an hour from the last stop to the hotel! Lol. Everything was great except wi fi. Only 500mb per 24 hours before you had to pay and often found wi fi would "connect" but no internet. Occurred across 2 phones and 2 tablets so not a device issue.